Scansfer allows you to tranfser data and files easily between computers and phones, or your Android phone and another phone, through the use of QR codes. Yes. 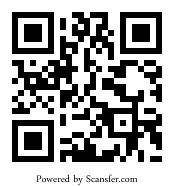 Click here to visit our page in the Android Market or scan the QR code below to install. It’s already in development! If you’d like to be notified when the iPhone app is available, please contact us.